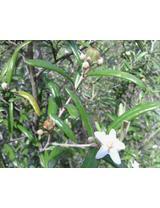 Description: Shrub to 3 m high, branches hairy with long stellate hairs. Leaves lanceolate to ± oblong, 2–8 cm long, 5–12 mm wide, upper surface with stellate hairs when young, glabrous with age, lower surface densely rusty-tomentose; petiole 3–8 mm long. Flowers in clusters of c. 5 males and 1 female, peduncle 10–20 mm long. 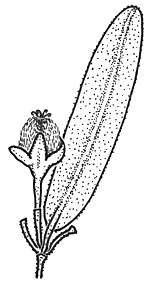 Sepals c. 4 mm long. Petals c. 1 cm long, white. Capsule oblong, c. 10 mm long, covered with long stellate hairs, sometimes glabrescent; styles persistent. Found in a range of habitats, on creek banks, rocky slopes of hillsides, ridge tops, and old floodplains.